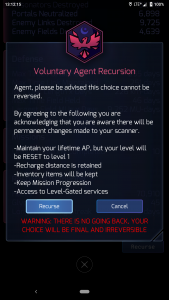 Recursion is resetting your agent account back to level 1, optionally changing faction. It is similar to the “prestige” mechanic in other games. This action is available only to level 16 agents and is irreversible. Not to be confused with the Recursion anomaly. Recursion sets your level to 1 and your AP to 0 (though you will still be able to see your lifetime AP, which is all AP you’ve gained through all recursions). You also retain your recharge distance, inventory items and keys, mission progress, and access to level-gated services (portal submissions, Operation Portal Recon and the Mission Creator Tool). You can also choose to change faction when you recurse. Recursion awards you the Simulacrum medal and puts an icon next to your name on your agent profile. On your recursion, you can also re-earn your other medals, which will be decorated with an indicator to show that you’ve earned them multiple times. To recurse, open your agent profile by tapping on your avatar at the upper-left, then scroll to the very bottom and tap the “Recurse” button. A dialog will be displayed, explaining what recursion does. After you tap “Read more,” the dialog will display two buttons at the bottom: “Recurse” to proceed, or “Cancel” if you decide not to recurse. Recursion was introduced on 5 November 2018 with the release of Ingress Prime.